New Look Broderie White Black Cotton Embroidered Top 6. Condition is Used but looks as new! It says petite but it’s not very short. Guess it’s more to a normal! Dispatched with Royal Mail 2nd Class. New Look mustard colour t-shirt in Size 10 petite. Short sleeves with logo print to front. Used but in excellent condition. All my clothing has belonged to my daughter and the condition is clearly stated. A lovely top from New Look Petite. UK 14 EU 42. 100% cotton. Trim 100% polyester. Key hole and ties at back. Hem goes to point. Length 19". Great condition. Embroidery detail to front, collar and cuff. Casual Wear. In used but good condition although there are very light stains to the front. Slip on with no fastening detail. Ladies Denim Chambray Shirt from New Look. UK 14 Petite. Beautiful dark green long dress, petite size....fitting as jersery material. Never worn. Ladies Size 8 Petite denim shirt from new look. New Look top, only worn a couple of times, no signs of wear and no stains, will wash before posting. It comes up as a small size 8. New Look Size 8 Petite Black Jersey Jumpsuit With Wrap Top And Tie At Waist and long sleeves. Really gorgeous on trend jersey with elastane jumpsuit with pretty gathers on shoulders, tie belt, stretch, straight leg. Really flattering and comfortable to wear . Can be dressed up for evening and dresses down for day with sandals. Very versatile . My daughter tried it on but never wore it out even though looked beautiful in it. It has come apart slightly on seam at shoulder (see last photo) I could easily sew it up along sleeve but I thought it better to let buyer do that. New Look lovely scoop neck vest in soft cotton. In my opinion I would go for a size down if you are between sizes, I am a 10 but prefer an 8 in this. New Look Petite Ladies White Badot Top Size 10. Condition is Used. Dispatched with Royal Mail 2nd Class. OLIVE GREEN/KHAKI. CHEST SIZE SUIT 32-34". 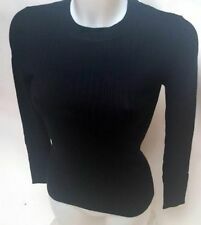 HERE IS A VERY NICE QUALITY 3/4 SLEEVE TOP FROM. EX NEW-LOOK. 100% COTTON. RIBBED DETAIL TO NECKLINE, HEM AND SLEEVE ENDS. Women’s casual Sleeveless Black Mix Floral Summer Floaty Top Size M Petite By New Look. Condition is good Used. Dispatched with Royal Mail 2nd Class. Pit to pit approx 17” Length approx 21” Please note that label for care and fabric has faded this is of a cotton type. Please see pictures 11/12 Please note, I try to get colours to show on photos as best as possible, but sometimes, on occasion, the camera isn’t as accurate as I’d like. I’ve described the colour, so please only bid on this understanding. Ivory crochet outer layer, lined inner layer;. 80% Polyester/20% Cotton;. Two button fastening to back of neck;. A black t-shirt, with a multi colour neon front print of Tinkerbell, surrounding by coloured spots. A LADIES OR GIRLS TINKERBELL FAIRY T-SHIRT BY NEW LOOK. Size ~ UK 8. Machine washable . T-shirt length ~ 23" / 58.5 cm's. IN ORANGE RIBBED COTTON. 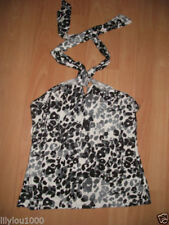 HAVE FOR SALE THIS LADIES SUN TOP FROM NEW LOOK SIZE 8. The top has been worn, and I have cut out the label because it was uncomfortable but apart from that the top is still in great condition. Just a bit neat on me at size 8 regular. TUNIC TOP/DRESS SIZE 6 PETITE NEW LOOK NAVY MARL COTTON BLEND GREAT CONDITION. Condition is Used. Dispatched with Royal Mail 2nd Class. HERE IS A LOVELY QUALITY LADIES TOP/BLOUSE FROM. EX NEW LOOK. PLEAT DETAIL TO FRONT AND SHOULDER. SHORT 'FLARED' SLEEVES. 50% COTTON WITH A LITTLE 'GIVE'. LENGTH 25". 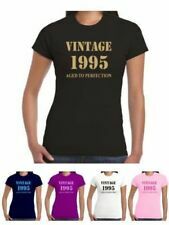 WOMENS NEW LOOK PETITE T SHIRT TOP RUFFLE ACCROSS THE FRONT GREY COLOUR SIZE UK 10 GOOD USED CONDITION I POST SECOND CLASS ROYAL MAIL AND ALWAYS RETAIN PROOF OF POSTING. P&P COSTS ARE FOR POSTAGE AND PACKAGING PLEASE PAY WITHIN 3 DAYS OF LISTING ENDING. ANY QUESTIONS PLEASE ASK THROUGH EBAY AND I WILL ANSWER ASAP. THANKS FOR LOOKING.